A good spread.. and this was after we’d eaten quite a lot! So, today we had our first Cake and Craft session at Denmark Farm. We are raising funds for the Shared Earth Trust, an environmental education charity, by meeting up to eat cake and have a lovely sociable time whilst using our craft skills to create some things that we can raffle off in the autumn. It all started with my masterpiece blanket… I thought – if people round the world want to contribute to a community craft project, why not people in my local area? And so, we planned a few afternoon get-togethers. Today ten ladies arrived full of ideas and enthusiasm… and many of them brought cake. So, we chatted and we ate cake and we had some ideas: a blanket of six-inch squares; a community quilt; a needle-felted tree of life with all sorts of embellishments. 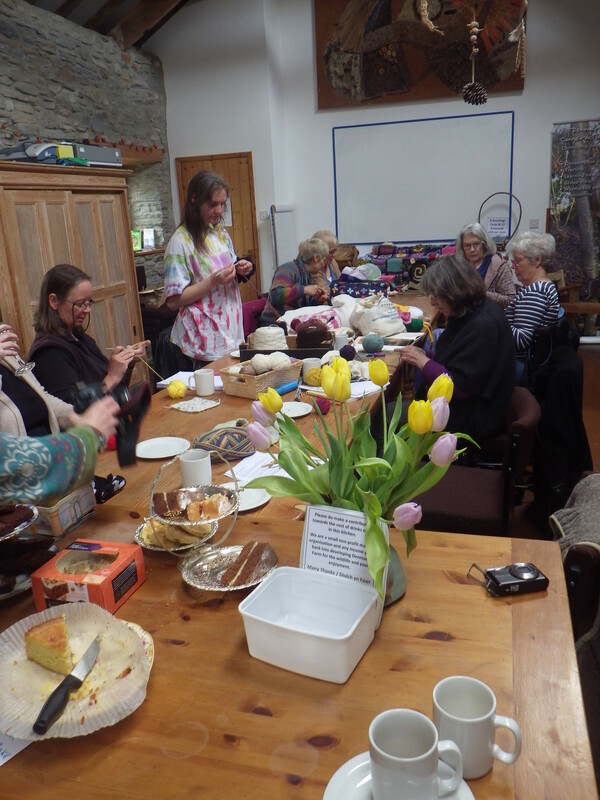 Then we did some crochet and knitting and patchwork and ate some more cake (there was quite a lot of cake). After two hours, we’d made a few things for our blankets, some of us had improved our crochet skills. And we’d had a lovely creative afternoon, full of positive energy and cake (did I mention, the cake?). We’re meeting again next month and we’re setting up a Facebook group so that we can share ideas in the interim… oh and we will probably have a stall at the Lampeter People’s Market, to get word out about our project and try to engage with lots more people. Much of the impetus to do this has been because of you… all you lovely blog-readers out there who were so enthusiastic about my first community craft project and made my masterpiece into such a special creation (I took it with me this afternoon and it was much admired). So thanks to all of you… it looks like I’ve found a real way to build community and build a better world! Had such a good time! 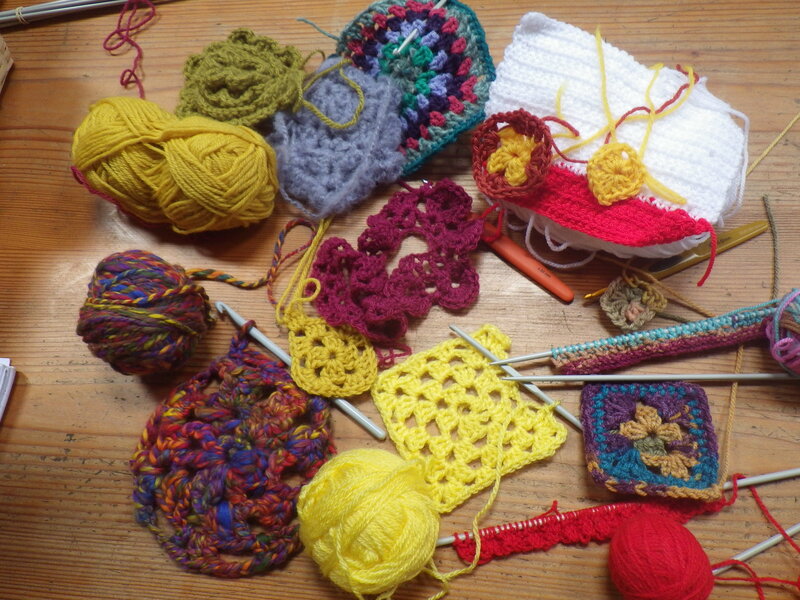 THANK YOU, Jan, for helping me negotiate the granny square again – the yellow one is almost finished and I’ll start another before the week’s out so that my fingers remember for a bit longer this time. That’s great… you’ll have done a whole blanket of your own at this rate! Wish I could come, I love this kind of ‘many hands-fun-community building-with cake -project’. Oh, I wish you could come too! All my blog friends did get a mention and everyone was keen to see the masterpiece when it’s finished, so a little piece of all of you will be there at the next session! And there you go, spreading the joy again…….and the cake of course. I trust there’s a piece in the post for all those of us who couldn’t make it or who can’t,knit, crochet or sew. A piece of cake will always be available to you if you are down in Aberaeron! It was such fun… can’t wait for the next one! Gosh, there was quite a lot of cake, wasn’t there…? I see Welshcakes there, of which I am particularly fond. One event I really wish I could have attended. I hope it goes from strength to strength. I really wish you could have been there too… there were even two gluten-free offerings: my chocolate brownies (also dairy-free) and a wonderfully squishy lemon drizzle cake. The rest of my browines went in the freezer for next time! Maybe we should have one meeting with skype attendees! Of course, it makes sharing the cake a bit difficult, but it would allow the more distant among us a chance to join in. Yes indeed! But perhaps with fewer hats… and more cake! Certainly not soggy shortbread, anyway! I thought you might appreciate the cake stands too… both the 3-tier china one and the Indian silver one are mine… they don’t get an outing very often! It all looks wonderful Jan – both the crafting, and the cake – so I hope you have many more sessions like it! A wonderful event and a wonderful post (“there was quite a lot of cake”) about it. My 4th grade teacher taught all of us students how to crochet, but I haven’t made anything for decades. The elegant simplicity of someone’s yellow crochet square may inspire me to buy a crochet hook and some non-itchy yarn…and maybe bake a cake. Perhaps I should also bake ‘meditation cake’! Thank you… everyone should do it! 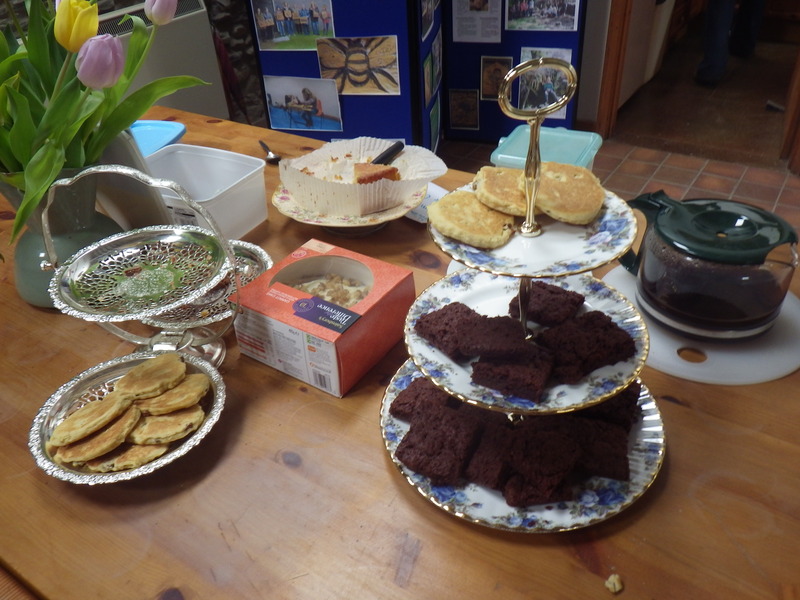 We even had dairy and gluten-free cakes (two types)… but they were quite sugar-rich!!! !